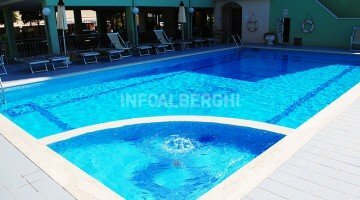 The Hotel Abacus , three stars of Valverde di Cesenatico, offers many services including: genuine cooking and housewife, parking, swimming pool, solarium, entertainment for children and many services dedicated to families and children. Admits small animals. The hotel is located in via Bernini, first parallel to the seafront, a few steps from the beach. Valverde is a quiet and well-served seaside resort, just a few minutes walk from Cesenatico. All rooms are equipped with air conditioning, telephone, safe, WI-FI connection, satellite LCD TV, private bathroom with shower and hairdryer. There are three different types available which differ in position: on the mountain side without balcony, on the mountain side with balcony, on the sea side with balcony. FAMILIES : more spacious rooms are available, able to accommodate up to 6 people. 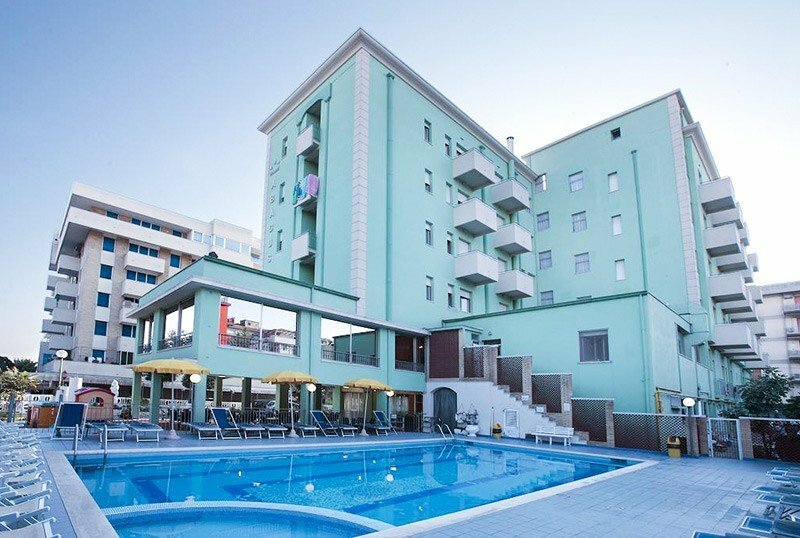 Swimming pool with hydromassage and corner dedicated to children, sun terrace with loungers and armchairs, free bicycles, hall with newspapers, playground area for children, two lifts, TV room sat. The staff organizes parties, baby dance and group dances. Every Thursday evenings at the pool with music, cabaret and raffle with the mascot Arturo the kangaroo. PARKING : uncovered, available for all to 600 m from the structure. CONVENTIONS : beach, theme parks, waterslide. LUNCH AND DINNER : wide choice of first and second courses of meat and fish, appetizers and side dishes. In Formula Village the service is entirely buffet. In the hotel : spaces equipped with games for the little ones (one in the restaurant area and one in the courtyard area), strollers, entertainment, ping-pong table and table football table for the boys, changing table available in the common areas. In the room : cots on request and at no extra cost, baby bath tubs, bottle warmers on request and at no extra cost. At meals : crockery, glasses, cutlery, plates, place mats and high chairs, small but functional kitchen with kitchenette and microwave oven, afternoon snack, weekly lunch with the animators. The chefs prepare the broth and vegetable past every day, made only with fresh seasonal vegetables, without adding salt or preparations. The outdoor pool, 90 square meters, has a hydromassage corner and a children's area with shallow water. In the adjacent porch there are sunbeds, armchairs and tables. The hotel has an agreement with the nearby Bagno Eden, which offers a playground area for children, entertainment, a relaxation area and a bar with catering. The list prices are in All Inclusive formula per person for a min. of 7 days. - Bonus reserved for Costa Vacanze Card Club owners: by booking at any time, you receive an additional 2% discount. We are waiting for you and your family with our All Inclusive Formula. Minimum stay 7 days, starting from € 49.00 per person per day. Family Top Services: playground, baby snack, mini club, baby lunch and much more .. In June the Children are FREE! In June We are waiting for you in Valverde di Cesenatico to spend a real All Inclusive holiday! Spend the first real summer bridge in our Family Hotel! Choose the Hotel Abacus of Valverde di Cesenatico. Our All Inclusive formula: full board, drinks with meals, full time soft drinks, beach service with a beach umbrella and two sunbeds, swimming pool, entertainment, bicycles, parking. In July We are waiting for you in Valverde di Cesenatico to spend a real All Inclusive holiday! In August We are waiting for you in Valverde di Cesenatico to spend a real All Inclusive holiday!